I was pretty shocked when I read Faye's post about the vegan options at St Kilda's version of The Snug Public House - the Brunswick branch has always seemed quietly charming but very, very meaty. Luckily for us though, the St Kilda vegan menu seems to have gone well, prompting the owners to start rolling out vegan options out near us. We dropped by with a couple of friends on one of their first vegan-friendly nights to check things out. It's a small pub, with just a handful of tables inside and a few more in their cute little courtyard. They were still sorting out the menu when we visited - there were just four dishes on offer and things were still changing from night to night. They're promising that a bigger menu is on its way, including vegan options for weekend brunch. Exciting times! The kitchen got us started with Guinness bread and Nuttelex while we workshopped our options. In the end, with four dishes to choose from and four people eating, it was clear what we had to do: one of each to share. First up was the burrito - a massive tortilla stuffed with rice, jackfruit pulled 'pork' and coriander, topped with vegan sour cream, salsa and minced jalapeno ($23). This was ludicrously big, and anyone ordering it on their own would surely struggle. Between four it worked okay, although the burrito filling was very heavy on the rice and a bit light on the jackfruit. Next up were the chilli garlic prawns, with grilled asparagus and steamed rice ($23). I'm usually pretty skeptical of mock prawns, but this dish just about converted me. The chilli sauce was the highlight - spicy, garlicky and just about the best way to make the slightly rubbery mock prawns work. This was among the most popular dishes for the table. The remaining dishes were more classic Irish fare, starting with bangers and mash with peas, caramelised onion and gravy ($23). I loved getting a vegan version of this kind of classic pub food, and so much about it was perfect - wonderful gravy, creamy mash and beautifully cooked onions. The bangers let things down a teeny bit - I'm not sure what brand they're using (or if they're making their own), but they were a bit on the dense side. Still a pretty excellent meal and one that would be perfect with just a few tweaks. The final dish of the night was a potato gratin, served with steamed peas and a chorizo ragu. This was the another favourite - the gratin was wonderful and combined nicely with the surprisingly good ragu. The Snug's vegan turn is really exciting - it's probably the closest pub to our house and is perfectly placed to scoop up any vegan pub-food spillover from the always-busy Cornish Arms up the road. The food was excellent, the staff enthusiastic and friendly, and the atmosphere charmingly relaxed. We'll be keeping a close eye on things here - other vegans and vegetarians should get along and make sure the vegan menu is worth the pub's while! 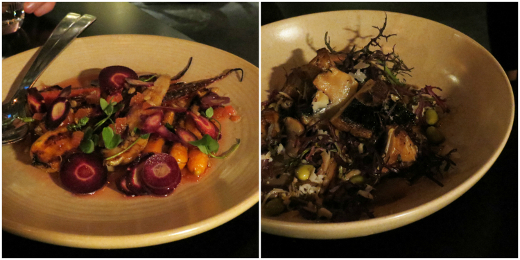 Veganopolous brought The Snug to our attention with her review of the vegan options at the St Kilda venue. Positive Brunswick reviews from What Em Did, Parma Daze and Gourmet Chick are of the meaty menu. Accessibility: The interior is crowded, with a mix of tables and high seats at the bar. The courtyard has bench seats and stools. You order at the table and pay at the bar. Recently two of our friends got married, and they held a vegan potluck reception. We are enthusiastic potluckers under any conditions, and a wedding celebration predictably set us into overdrive. We brought a double batch of sausage rolls with barbecue sauce, mango & coconut rice salad, mango & coconut splice jellies, and finally, this cake. I'd seen it earlier in the week on Around the World Vegan - I liked that it was already vegan and gluten-free, and I had a stash of rose petals in the pantry that I was keen to make use of. Best of all, a dessert named Persian Love Cake would be perfect for the occasion. The cake, even though it has two layers, comes together in one bowl without need of an electric mixer. Based on almond meal and polenta, it has a sandy texture but none of the chalkiness that I often notice with commercial gluten-free flour mixes. I'd consider trading some of the polenta for more almond meal if I baked this again, aiming for a softer and probably denser crumb. Keira made both a syrup and an icing for her cake, but instead I tried to combine their best elements into a single glaze flavoured with lime juice and rosewater. It tasted fabulous but its consistency was a bit too thin, and I used up all the icing sugar I had on hand. It's the pistachios and rose petals that elevate a quite plain-looking cake to an absolute stunner, but they provide complementary flavour as well as good looks. This is a cake that demands it be seen and shared and celebrated, and we did just that. Preheat an oven to 180°C. Line a cake tin with paper. In a large bowl, stir together the almond meal, polenta and sugar. Add the margarine and combine it all, using pressing motions with a fork. Press half of this mixture into the base of the cake tin. Whisk together the cornflour and water in a mug. Pour it into the remaining mixture in the bowl, along with the yoghurt and the spices. Stir everything together until well combined, then pour it into the cake tin. Bake until set and golden, 30-35 minutes. Cool the cake completely to room temperature. Sift the icing sugar into a small bowl and whisk in the lime juice and rosewater. Spoon the icing over the cooled cake and sprinkle it with pistachios and rose petals. Almost every time Cindy and I eat in the CBD we wind up heading to Shandong Mama or Shanghai Street, so we were delighted when Hayley suggested a pre-movie meal at Grand Trailer Park Taverna. Melbourne's obsession with dude-food is getting a bit tiresome, but even the most committed dumpling-heads need a change sometimes. 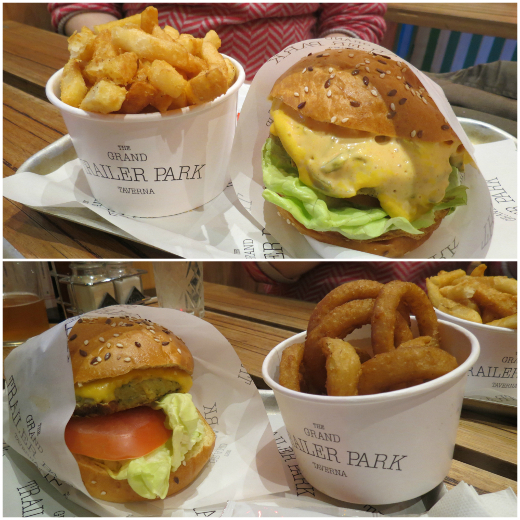 Grand Trailer Park Taverna exploded onto Melbourne's burger scene a few years back, with queues out the door and inordinate amounts of buzz (see the blog round-up below). Things appear to have mellowed slightly, and we had no trouble getting a table early on a Tuesday night. It's a beautiful setup, with tables nestled inside wooden caravan cut-outs and little cabins, chandeliers on the ceiling and a bright, cheerful vibe. The menu is a glorious paean to junk food, featuring ridiculous boozy milkshakes, a selection of burgers, loads of fried sides and mad dessert dishes like an ice-cream donut sandwich or the menacingly titled 'chocopalypse'. Vegans are basically going to be stuck eating chips and onion rings - it seems a shame that they haven't come up with an option or two burger-wise, but they're clearly focussing on the meaty end of the market. The drinks menu is fantastic - we couldn't stomach the idea of boozy milkshakes, but the cocktails provided an excellent fallback option - the apple collins ($18) and dark and stormy ($18) pictured above were both superb. 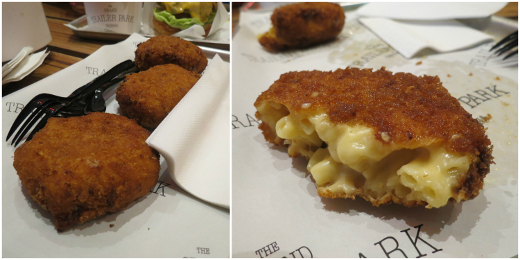 Food-wise, we kicked things off with a mac 'n' cheese croquette each ($4.50). We all expected something small and spherical, so these giant squares of fried came as something of a shock. There's just the one vego burger on the menu - the Shaquitta (chickpea patty, cheddar cheese, tomato, butter, lettuce, special burger sauce and mustard on a brioche bun, $12.50). We added a serve of the fries ($5.50) and the onion rings ($5.50) to round out the savoury portion of the meal. The burger was adequate - heavy on the cheese and sauce, which covered for a reasonably unexciting patty. I was moaning about the brioche buns as we ordered, but this one was surprisingly okay - far from the sickly sweet mess that some places serve up. The chips and onion rings were crispy fried and salty, which is a recipe for success (and a second round of drinks). One of the main reasons we'd ended up at Grand Trailer Park was Cindy and Hayley's shared excitement over the dessert menu. The ridiculousness is typified by the $38 giant waffle stack and the aforementioned chocopalypse (described thusly, "Look. Feel. Hear. Smell. Taste. At the end??? Have a goodnight"), but even the smaller options are a bit mad. We went for a regular waffle stack - a pair of waffles sandwiching Nutella parfait, whipped cream and strawberries all drowning in a Nutella sauce ($10). I'd over-committed on the savoury round, so I only sampled a teeny bit of this. It was as rich and ridiculous as it looks, but that's what we were there for. This would surely be impossible for anyone to finish on their own, but split a few ways it worked well, with the strawberries providing at least some respite from the choc-creaminess of the rest. 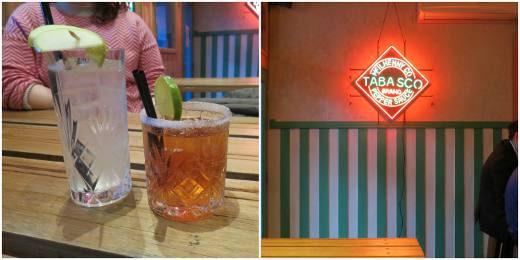 We had fun at Grand Trailer Park Taverna - the staff were friendly and efficient and the vibe of the place was lovely. I imagine things get a bit more hectic on a Friday night, but it was a surprisingly relaxed place for dinner on a Tuesday. The food is junky and the vego options are limited, but it's worth a visit for the ridiculous desserts and great drinks. Thoughts of a Moni provided a rare review of the vego burger, while there were very positive meaty reviews at Ordinary Girl, Extraordinary Dreamer, For Food's Sake, I'm so Hungree, The Very, Very Hungry Caterpillar, Olive Sundays, New International Students, De-Briefme, Big Picture Stuff, MEL: HOT OR NOT, confessions of a little piggy, Bauble, Bubbles and Bags, Hashtag, The City Walker, Eye Eat, Dang It We Love Food, The Melbourne Glutton, Team Cheeseburger, trading plates, Gastronomical Ramblings, Foodie Melbourne, The Domestic Traveller, Fun Date Ideas, Lips Temptations, BLK's Food Blog, Eve Lovelle, Crushing on Food, Food Comatose, Mango Macarons, Ichigo Shortcake, Melbourne Vita, Kit and Kafoodle, Burgers of Melbourne, Andrew's Food Adventures, Good Food Good Karma, Eat My Words, The Food Society, Eat Like Ushi, delightfully tasty and Foodie About Town. The Burger Adventure, Linnie Eats all the Food, Snow Crab Nebula, Journey from Within, DonutSam, Gastronomic Gems and Wandering Mint were all a bit less excited, but nobody was hugely negative about their experiences at Grand Trailer Park. Accessibility: The only way in seems to be via a set of stairs, which isn't ideal. Inside, there's a mix of high and regular tables. You order at a high counter and the food is brought to your table. Toilets are gendered and not notably accessible. On our return from Western Australia we wanted something quick and healthy to ease ourselves back into the non-holiday routine - this tofu in lemongrass broth was the perfect choice. We've been making it regularly since we first posted about it back in 2008, so we figured it was time to finally put the recipe on here rather than relying on the old post at Nourish Me staying up forever. It's a really simple recipe, but a really great one (it's already featured in our where's the best list!). It's all about the broth - fragrant and spicy and carrying the simple veggies and tofu to new heights. A great dish for Melbourne's cold spring nights, but only if you're pro-coriander! Start cooking some rice before you get started on the rest, it all comes together quite quickly. Put the lemongrass, ginger, lime leaves and coriander stalks in a saucepan with the water and a big pinch of salt. Bring the mix to the boil and then simmer uncovered until the mixture has reduced by half (about 15 minutes). Sieve out the bits and pieces and then stir the tamari and sugar into the liquid. Heat the oil in a large frying pan and add the onions, garlic and chilli, stir-frying for a couple of minutes until they start to soften. Add the beans, broccolini and tofu and keep stir-frying for another few minutes, until the vegies are just cooked. Pour in the broth and the coconut milk and simmer for a few more minutes. Stir in all of the coriander leaves and cook for a final minute, until they've wilted down a bit. Taste and add more salt if required. Serve over rice, with a generous sprinkling of fried shallots on top. After our time in Perth and Fremantle, we headed down the south coast to spend the rest of the week in sleepy Busselton. We'd imagined a beachy holiday, but WA's weather didn't really oblige. Instead, we had a quiet few days lounging around our apartment reading books and eating treats and generally kicking back. We didn't come to Busselton for the food, but we took our chance to explore what was on offer. We started off by checking out The Fire Station, a bar and restaurant in a gorgeous old building. It's cosy inside with a fire going and a steady stream of customers. You can swing by to try the impressive array of craft beer and local wines, or settle in for a meal. We had no trouble getting a table on the two nights that we stopped by, but I'd guess things would get pretty hectic when summer rolled around. The menu is very gastropub, with a selection of pizzas, pastas and some meatier options. There are enough vego options to go around, but vegans will struggle. Cindy ordered the pan fried gnocchi with Swiss brown mushrooms, cherry tomatoes, burnt butter, sage & goats cheese ($24). It was a lovely meal: plump fluffy gnocchi with lots of earthy mushrooms and a few bursts of freshness from the tomatoes. I took on one of the vego pizzas, with parsnips, honey, goats cheese and a rocket and horseradish pesto ($22). This was another success - a crisp, light base with an inventive combination of toppings. The Fire Station really impressed me - it had classy pub food in a charming setting, with friendly staff and a great selection of booze. We stopped by for a drink on one of our other evenings in town just to enjoy the atmosphere - it's definitely worth a visit. The other noteworthy place we ate at in Busselton was Mana Kai Cafe, an almost-vegetarian place (there's one salmon dish I think) tucked into a little arcade. They're a daytime eatery, with a range of made-to-order breakfast and lunch options, plus a stack of pre-made goodies in the display cases. There are plenty of vegan options. We started out by sampling their fancy drinks - a detox juice (celery, mint, parsley, cucumber, kale and pear) for me and a citrus blast (lemon, lime, orange, apple) for Cindy. At $9 a pop these aren't cheap, but they're refreshing and delicious. Cindy cobbled together a lunch by combining a savoury muffin ($5) with handcut potato skins with a combo of chutney and garlic yoghurt dressing ($6). I tested the kitchen out a bit more with the Asian bowl - marinated tempeh, rice noodles, kim chi, carrot, sprouts, corn, red cabbage and greens with a miso and ginger dressing ($15.50). This was a delight - loaded with fresh vegetables and bursting with flavour thanks to the kim chi and the miso dressing. A perfect counterbalance to all the pizzas I ate over our holiday. Mana Kai was heaving on our visit and they seemed to be equally popular with locals and tourists. It's great to see a vego place doing so well outside of the big cities. I'm sure it's a haven for vegan visitors to Busselton. We had a nice quiet few days in Busselton, enjoying a day tour around the Margaret River area and sneaking in quite a few visits to the wonderful birdhide on the Vasse River - some photographic highlights are below. 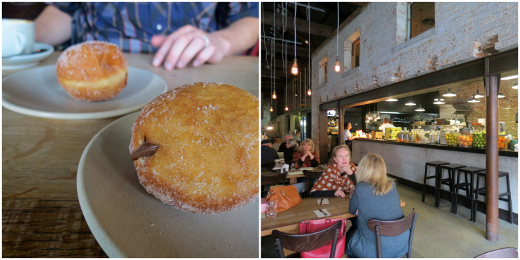 The eating highlight of our time in Fremantle was Bread in Common. 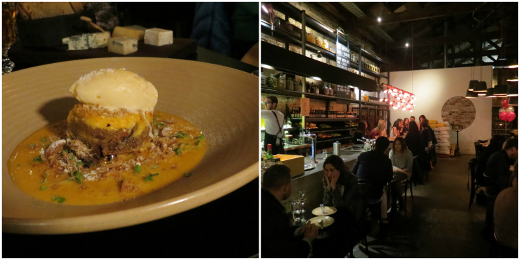 It's a converted warehouse with long communal tables and a no-bookings policy that reminded me of Garagistes, and we took a punt on it for a fancy dinner. The sharing menu is a good one for vegetarians, and solid for vegans too (we overheard one sitting next to us and he seemed to be a regular!). Gluten-free folks also have plenty to choose from but the severely allergic may wish to proceed with caution - this restaurant is clearly proud of its bread and operates as a flour-dusted bakery as well as a restaurant. We were in the mood for cocktails - Michael enjoyed a negroni ($17) served with a huge ice sphere and I tried their burnt lime mule ($18). Unlimited bread comes with a $2 per person price tag, and the first section of the menu is an array of little foods that complement it. Although we ordered the sweet garlic butter with fennel salt ($2), we strongly suspect that we received the unflavoured butter - it was still pretty good. 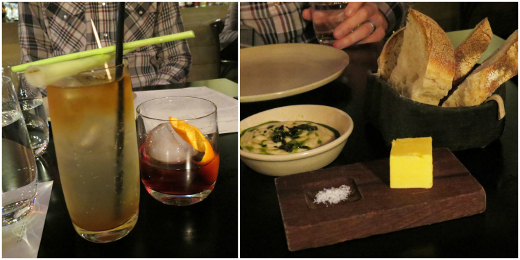 Even better was the vegan-friendly white bean puree swirled with rosemary and saltbush ($4). A plate of orange and purple carrots ($19) was made sweet and sour with compressed rhubarb and sprinkled with pumpkin seeds. Late season mushrooms ($20) were much more savoury, flavoured with shallots, miso, edamame and blue cheese then crowned with mustard leaves. Our favourite was the sweet potato dish ($21) with artichokes, macadamias, capers and verjuice - it captured sweet and savoury equally and expertly. For dessert, Michael took a rare trip into cheese platter territory ($32), gleefully picking his way through a Cambray Farmhouse cheddar, Onetik Bleu de Basque, Auvermont Bleu, Le Marquis Chevre, toasted breads and a glass of Hekate Passito ($13). While these were certainly special-occasion prices, we were satisfied that we received a special-occasion experience, from the service and setting to the vegetarian dishes and the extravagent extras. When our hopes of visiting vegetarian cafe Juicy Beetroot fell through a couple of days later, Bread in Common was an easy fallback breakfast. To our surprise, the prices at this time of day were no higher than we'd paid for breakfast at other Perth and Fremantle cafes. 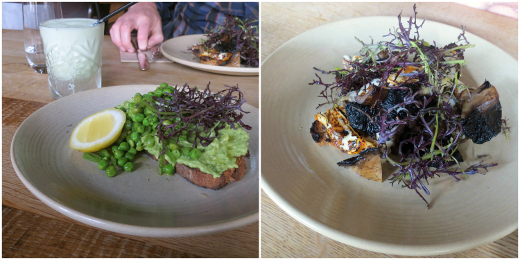 I tried their version of the ubiquitous avocado smash ($17), which came with a lemon sliver, abundant fresh peas, a few purplish-green leaves and some sadly burned and too-tough-to-cut sourdough toast. I found the perfect smoothie to drink with it ($8), a slushy pale green glass of coconut, apple and lime. Michael decided to reprise the mushrooms ($21). In the morning they're served richly with taleggio, mushroom ketchup and wholemeal toast. Michael easily convinced me to pick something from their sweets list. The jam and chocolate hazelnut (read: Nutella) donuts ($5 each) were just fine, nothing special. I really should have ordered one of those housemade Oreos, huh? It was probably lucky that we entered Bread in Common ignorant of the widespread hype (see blog posts below, for example). 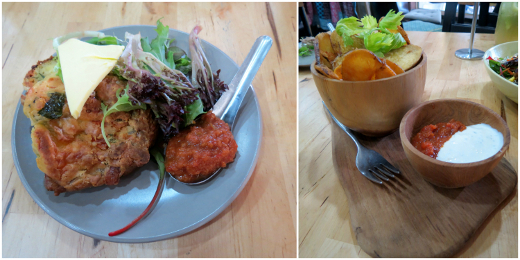 Their incidentally-veg dishes were bright and tasty, and their high-end-but-casual style wasn't too pretentious. Eating out in Perth is frequently expensive, and in this context Bread in Common feels like even better value. This restaurant has already had massive blog coverage, albeit not from a veg*n perspective. It's won fans on Awwyum Productions, The Food Enthusiasts, iMasticate, 1 Hungry Banana, Perth Cafe Culture, ChiGarden, The Provocative Couture, Foodvixen, The Chef, His Wife and their Perthfect Life, JKP, Lion in the Wild, 4 In Our House, Lei Lady Lei, all the little extras, Laura's Mess, Milktea Eats, AngelaMichella, The Illusive Femme, Chomp Chomp, Ministry of Gluttony, My Funny Valentine, frenchtoastandindiepop, Feed Your Soul, Perth, One Bite More, Wino sapien, libertineeats.com, Christobel and Love Freo. Reviews are more mixed on BLK's Food Blog and FoodPorn Journal, then distinctly disappointed on Morsels, WenY Wonders Why, Perth Food Blog and Taste Test - Food.Life. Accessibility: They've been mindful in their design - wide flat entry and clear corridors, although tables can be densely packed. We ordered at the table, also paying there for dinner but paying at a high counter for breakfast. Toilets were gendered but included a third fully accessible option.